Think of two spinners who have created an enigma in the last couple of years and you are talking about Rashid Khan and Kuldeep Yadav. The two wrist spinners have been bamboozling the opposition batsmen with their variations in the limited-overs format. With consistent and troubling performances they’ve earned quite a reputation at the international stage in a really short span. 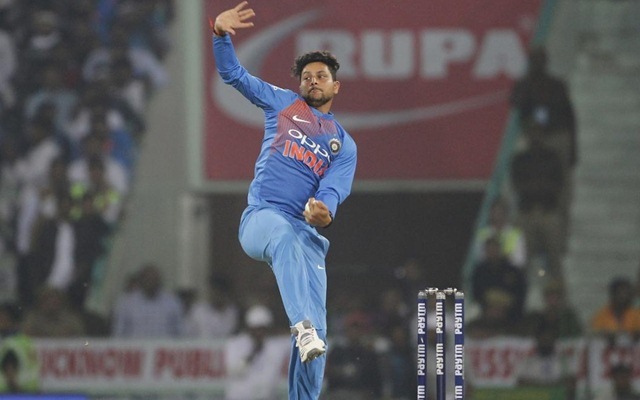 During the first T20 international at the Gabba, Kuldeep put up a spectacular performance with the ball. While Australia smashed 158 runs in 17 overs, Kuldeep had figures of 2/24 in the match. He accounted for skipper Aaron Finch and Chris Lynn who was looking dangerous with the bat. In course of the match, he now holds a scintillating record. India may have lost the match. However, it is interesting to note that Kuldeep now has the second-best bowling average i.e. 12.45 in T20 Internationals. Only Rashid has a marginally better average at 12.40. While the Afghan spinner’s economy rate is 6.05, the chinaman bowler isn’t too bad at 6.95. However, Rashid has played more games as compared to that of Kuldeep. In One-Day Internationals, Rashid has 118 wickets at an unbelievable bowling average of 14.47. As for Kuldeep, he has 67 wickets at 20.07 which is quite impressive. The Indian may hold a slight edge considering Rashid’s efforts have mostly come against associate nations and lesser teams. However, that takes nothing away from the world-class bowler the Afghan leg-spinner has proved himself to be. Hence, it’s not a surprise that teams have been forking out a huge chunk to retain them in the Indian Premier League. While KKR used RTM for Kuldeep to bag him for 5.8 crore, the SRH franchise brought back Rashid Khan for 7 crore. Both repaid their faith to the respective managements as Rashid got 21 wickets while Yadav ended up with 17 wickets. Ahead of IPL 2019, they were once again retained by their respective teams.